If we take hieroglyphic writings like the Egyptian one, an Egyptologist knows that this hieroglyph must be interpreted as Nefertiti. Or we can see in the following Sumerian cuneiform script that there is a syllabic representation of each cuneiform symbol. Since these writings (and others) are ideographic, I understand how I could interpret these ideas by translating them into my language. However, how do historians and linguists extract names or syllabic groups from this type of writing, especially when they are dead languages? By comparisons with known languages. 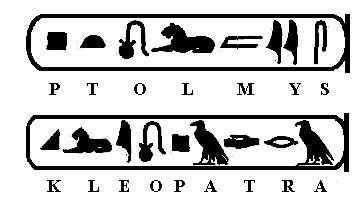 Let's take the example of Egyptian hieroglyphs. It is well known that the ancient Egyptian script was decoded thanks to the Rosetta Stone, which recorded an identical passage in Ancient Greek, Demotic, and hieroglyphs. The ancient Egyptian language, and hieroglyphs, were thus deciphered through comparison with the relatively well understood Greek. Naturally, in this process, scholars identified Greek names and the corresponding hieroglyphs. While the pronunciation of normal words no doubt varied wildly between different languages, names are generally transcribed into foreign languages phonetically. Thus Ptolemy Epiphanes (from the aforementioned Rosetta) written in Egyptian hieroglyphs would, presumably, be pronounced similarly to Ptolemy written in Greek. The phonetics of hieroglyph names correspond to names known from other languages. If the language survives to the modern day, even if only with another script, it can provide valuable pronunciation hints for partially translated hieroglyphs. This was how the great Jean-François Champollion identified the names Ramesses and Thutmose at Abu Simbel, by leveraging his knowledge of Coptic - the final descendant of the old Egyptian language. He noticed a cartouche containing the hieroglyph for sun (still ra in Coptic), an unknown glyph, and then s repeated twice. Pronouncing Sumerian is a much harder challenge. It effectively died out four thousand years ago, and went fully extinct by the 1st century AD. And as a language isolate Sumerian has no known descendant or even any related languages. Fortunately, Sumerian was an extremely influential language in its time and heavily affected Akkadian, which replaced it and adopted the same cuneiform script. This became key with the discovery of the Behistun Inscription - the Rosetta stone of cuneiforms. It contains cuneiform inscriptions in Old Persian, Akkadian, and Elamite. Old Persian had been partially cracked prior to this mostly in the form of place and royal names, but with the new find Sir Henry Rawlinson was able to fully decipher it in 1849. Then, starting with the names found in the Persian version, Reverend Edward Hincks and later others then deciphered the Akkadian version. As mentioned earlier, Sumerian had an immense influence on Akkadian, including numerous loan words. With the decipherment of the Akkadian cuneiform, we now know how the language was written. Moreover, while Akkadian itself have gone extinct, as a Semitic language it has many living relatives. It thus became possible to reconstruct the original language of Sumer. Needless to say, the reconstructed pronunciations of Sumerian are far from certain. For example, King Ur-Nammu was previously thought to be Ur-Engur or Ur-Gur. His son, Shulgi, likewise was misread as Dungi, and grandson Amar-Sin used to be Bur-Sin. This is a bit of a side note, but a somewhat similar problem was present in Chinese. Even though the language is far from dead and the writing stayed static, the pronunciation of Chinese characters have changed drastically over the millennia. Pronunciation guides were created starting with the Qieyun in AD 601. However, that still leaves a gap of over a millennium with Old Chinese, not to mention the oracle bone script from which it was derived. Unlike a phonetic/alphabetic script, these changes are impossible to trace from the script alone. In fact, Chinese scholars did not even notice the pronunciations have changed. The first realisation came from Chen Di in the late Ming Dynasty, who realised that the apparent lack of rhyming in ancient poems, such as those from the Classic of Poetry, was actually because the sounds had shifted in the intervening millennia. In this case, Chen had a huge corpus of ancient texts available and understood the meaning of each character well. He was thus able to begin reconstructing Old Chinese pronunciations by systematically mapping which words rhymed with what. The short answer is that we don't. The pronunciations we use today are our best guess at how the ancients pronounced their words. We know that Sumerian had an immense influence on the Semitic language Akkadian. Because Akkadian was a Semitic language, and we have a wealth of data about how related Semitic languages were pronounced, we can therefore deduce (by applying the regular sound laws) a reasonable approximation of how Akkadian would have been pronounced. Taking that back one step further, we can then use that best guess at Akkadian to approximate how we think Sumerian would have been pronounced. Happily, there are no ancient Sumerians around today to tell us we're wrong! We add the extra "e"s to make it pronounceable. This isn't just a wild guess though. In the Greco-Roman period, stelae were often carved in multiple languages (typically, Egyptian hieroglyphs, and Greek, although they could also be incised with a demotic version of the text). The best known example of this is, of course, the Rosetta Stone. Also, the Coptic language is a descendent of the ancient Egyptian language, so we have some guidance there. Additionally, names were often recorded in the records of other societies. They wrote them phonetically, as they heard them, and so are a good guide to how the Egyptians pronounced those names. But we know, from records of other contemporary civilisations that it was actually pronounced "Tut-ankh-amun". represents the letter "a". In fact, it represented what we call the aleph, and there is still no clear agreement on the sound that it represented. It may be the "glottal stop" and this is currently the majority view among Egyptologists. For convenience, we pronounce it as an "a", but we are by no means certain that is how the Ancient Egyptians pronounced it. Now, most popular books on Egyptology will tell you this should be pronounced as "e" or "i" or "j". The truth is far more complex. He is more familiar today by the Greek version of his name "Anubis" (you may have already guessed that from the "determinative" figure at the end of his name). 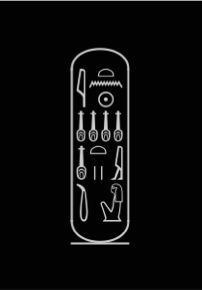 This is of particular relevance to the discussion here, since you will notice that, when written in hieroglyphs, the name Inpw begins with the single reed hieroglyph we saw above, and which I noted is usually said to represent an "e", "i", or "j". When written in Akkadian cuneiform, the name of the god was rendered as a-na-pa, and, as we have already seen, the Greeks made it "Anubis". So, the single reed clearly wasn't pronounced as an "e" or an "i" in this instance, but rather as something closer to an "a"! The essence of the individual was encapsulated in the name given to the child at birth. The hieroglyphs used to write that name also had meaning. Foreign names, however, did not have any special meaning. They could just be spelled out letter-by-letter using the hieroglyph that sounded closest to that letter. Thus we have the names foreign rulers, and also of the Macedonian Greek Ptolomeic kings from later inscriptions, like the Rosetta stone. These were rendered into hieroglyphs, and it is often those vowel sounds are then used when we try to pronounce ancient Egyptian names. which actually bears no relation to how it is generally pronounced ("Ian"), or indeed, how it should be pronounced (something close to the Scandinavian "Jan"), but which does match the letters to hieroglyphs!). When thinking about how words should have been pronounced, let us consider modern English for comparison. We have common words like "bath", "scone" or "either", which are pronounced quite differently in different part of the UK today. Those differences centre around how the vowel sounds should be pronounced. And those vowels are just what we are missing in many Egyptian inscriptions! Furthermore, we have to remember that the Egyptian language was in use for millennia. Just think about how the English language has evolved from the Old English, spoken by our Anglo Saxon ancestors a thousand years ago, to the language we speak today. However, I can also just-about read inscriptions in Old Egyptian and Late Egyptian (albeit that does involve reaching for the dictionary rather more often than I would have to with a Middle Egyptian text). But it is important to be aware that there are differences in the written forms of the words though, and that, in turn, probably meant that they were pronounced differently as well. Which brings me back to the beginning. The pronunciations that Egyptologists use today are just our best guess, based on the information available to us, at how the ancient Egyptians would have pronounced their words. Not the answer you're looking for? Browse other questions tagged cultural-history language writing or ask your own question. What are the modern names of the nations mentioned in Ystoria Mongalorum? Is this alphabet from tawantinsuyu or is it a modern invention (from the latter centuries)? How were foreign names written in runes? During the French Revolution, how did the French address non-citizens?